Brody’s health has deteriorated so that he no longer has the energy of a toddler or the use of his left arm and left leg. Five weeks ago, Brody Allen’s parents were told their 2-year-old son’s rare form of brain cancer meant he had two months to live. The Ohio boy’s family realized he probably wouldn’t be able to enjoy one more Christmas. So they decided to celebrate early, putting up a tree and decorations, and the neighborhood followed suit. There he can see an inflatable Minnie and Mickey Mouse, a snowman, Santa Claus and a Christmas tree in the yard of Barbara Elliott, a neighbor whose home is one of six in the Allens’ cul-de-sac that has been decorated for Brody. Brody’s family learned he was sick after he complained in May about being dizzy; a doctor said it was probably an ear infection. 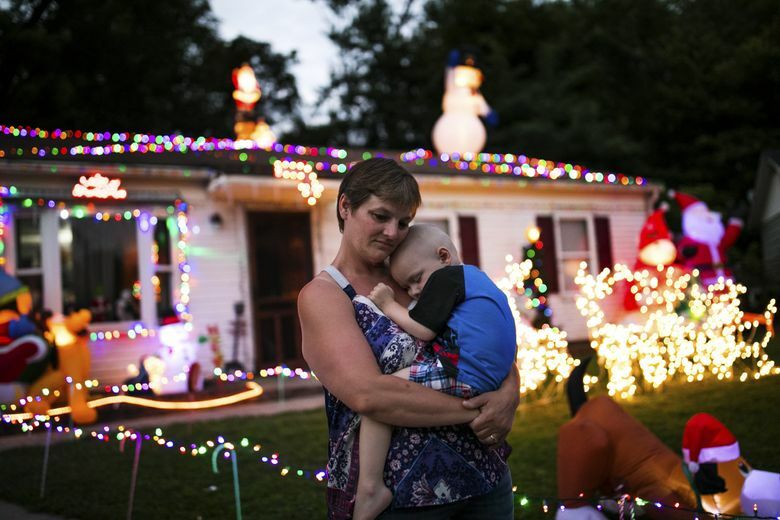 The family was sent to Cincinnati Children’s Hospital Medical Center for tests, which revealed that Brody had four embryonal tumors with multilayered rosettes. “One on his lower spine, one intertwined with his brain stem and two behind his pons,” McKenzie Allen said. It was not effective. One of Brody’s tumors grew by 30 percent, and he developed a fifth tumor in his brain. Using radiation to treat the tumors was not an option because Brody was too small. “It would just end up hurting him,” Todd Allen said. “I was willing to buy the decorations from them, but so many were donated,” Todd Allen said. Simpson appeared at the Allens’ door with a plastic tote filled with lights and decorations, and helped the family decorate inside and out. Simpson went back to the house to add more decorations four days in a row. He also helped neighbors decorate their houses. “My next-door neighbor, who only speaks Spanish, took down all her fall stuff and put up snowflakes and poinsettias, and did garland on her fence and lights,” McKenzie Elliott said. The community is planning a Christmas parade for Brody.